MARINA MIRAGE, C Jetty, Sea World Drive, Main Beach, Gold Coast. Biggest and Most Luxurious Fleet of Boats. Best way to Cruise, Fish or Spend a Day with The Family. 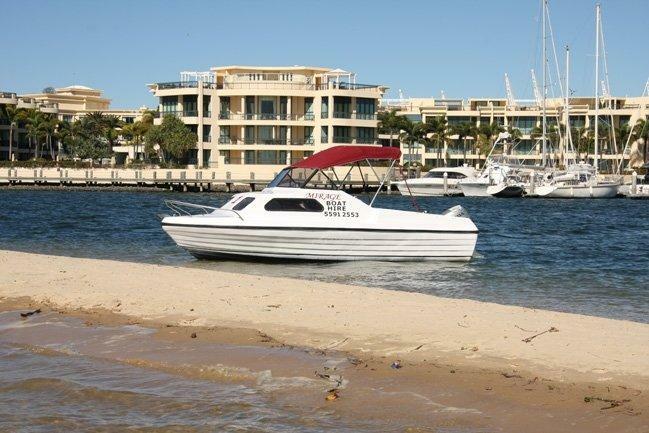 The 17’ half cabin cruiser can carry a maximum of 6 people, or is a very comfortable 4 person boat. Fully upholstered with a bimni top to protect you from the sun, this comfortable cruiser is a fun way to explore the waterways or enjoy a days fishing. Prices include one tank of fuel (25ltrs) – Ample for all day. *Weekday prices are for all weekdays except December 1 to 25 which are the same as weekend prices until 25th then peak pricing from 25/12 to 15/1. 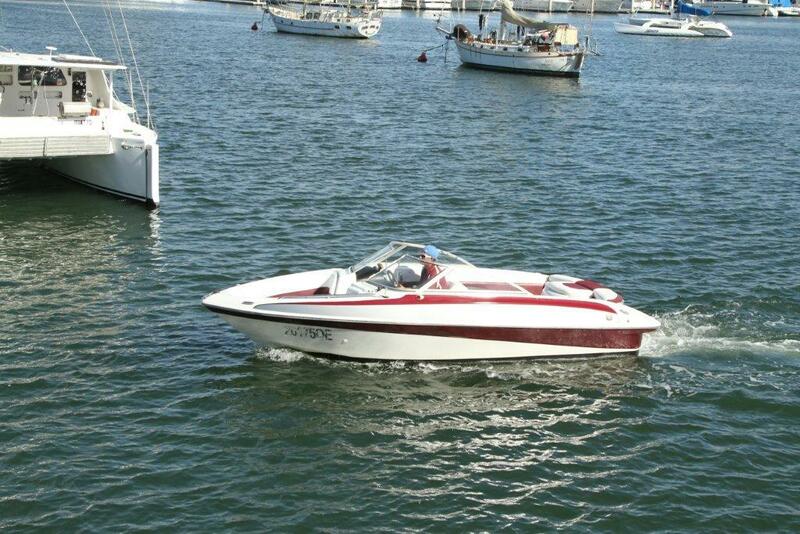 The 17’ speed boat for the licensed driver, is fitted with a 50hp motor and cruises at around 15 knots. Prices include one tank of fuel (40ltrs) – Should Last all Day. 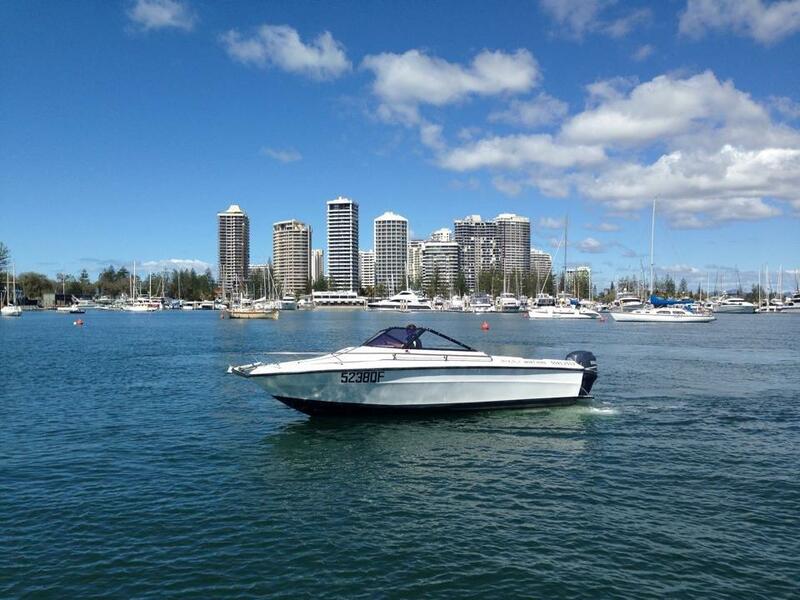 20’ Half Cabin Speed Boat licensed for 6 people fitted with a 115hp Yamaha 4 stroke engine and cruises at around 20 knots. It is fully upholstered for your comfort and has covers to protect you from the elements. Prices include one tank of fuel (50ltrs) – Should Last all Day. Only available with skipper for canal cruises, private tours and day trips. – No Water Skiing. Prices include one tank of fuel – Should Last all Day. 10 People, Prefererably 8 Adults Max 800kgs inc. Eskys etc. Both Sweetwaters have brand new 40hsp motors. 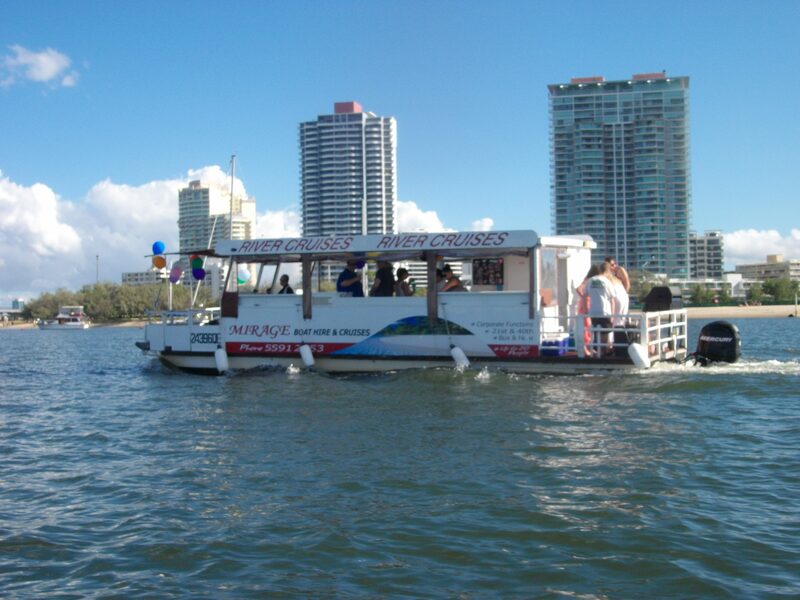 Easily the nicest & fastest non-licenced party pontoons on the Gold Coast. The Sweetwater Party Pontoon 1 & 2 are the ultimate day cruise boat, it has seating for 10 people and are very luxuriously appointed. They has an electric toilet on board and is supplied with a large cooler box, BBQ and stereo(mp3 compatible). For a great day out enjoying the fun and the sun, this is it. Now both fitted with stereos. There are the ever popular BBQ pontoons available, to carry 8 people. These fun boats are perfect for a day out fishing and relaxing on the water while you cook the fish you catch on the gas BBQ. They have toilets aboard and a large cooler box is supplied for your drinks. For only males – 4 hours maximum at all day price. 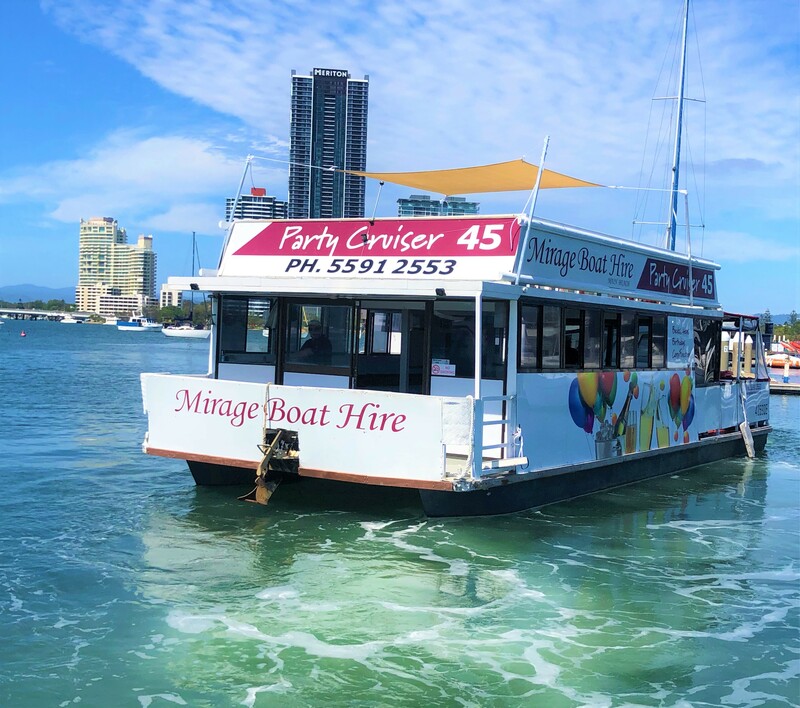 Mirage sun 33 holds 20 passengers and our skipper who takes you around the broadwater and canals in safety it has a stereo which an ipod can plug into, large bbq, toilet and comfortable seating in both good and bad conditions. Book now for your 21st Birthdays, Bucks Parties and private functions. Please call to confirm the prices for these events. 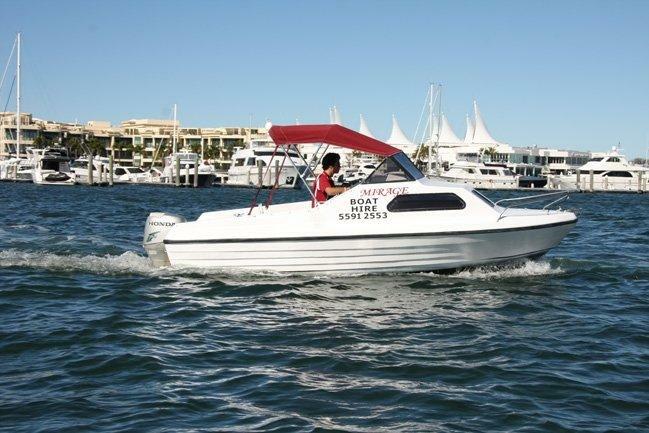 Collection and drop off can be arranged from Surfers Paradise on the water by your hired boat. Please mention this on booking to confirm price of pick up. 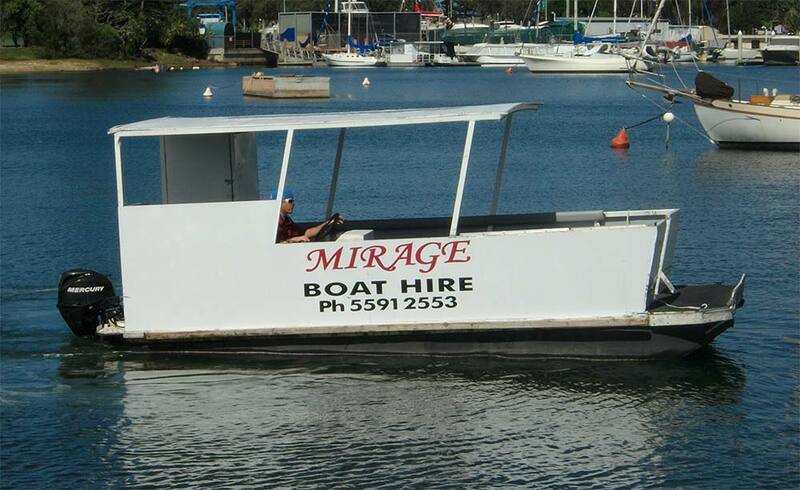 Max 45 Passengers Plus Our Skipper The mirage 45 party cruiser is ideal for any function, it has stereo which an ipod plugs into, tidy toilet, inside bar, good downstairs room both in an out with covers on rear for bad weather plus heaps of space upstairs for sun lovers. It has a large bbq and eskies for drinks, all ice included. All drivers must have enough experience for conditions and time of year as per Terms & Conditions. Sorry, no pets allowed. Proof of age may be asked for at the time of hire for all on board. A deposit of 50% of hire can be taken from credit card to secure booking. We do not accept cheques or AMEX. 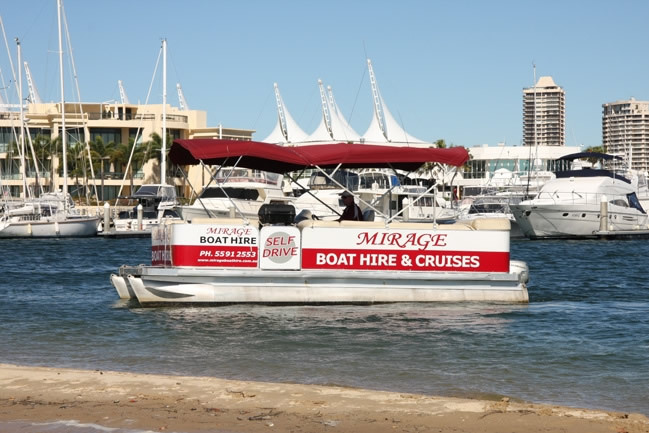 © Copyright 2019 Mirage Boat Hire, All Rights Reserved.